You never know what stage Robin Leventhal is going to star on next. One minute she’s running her own show at Crave, the tiny bistro that made it big during its five-year tenure on Capitol Hill. Next she’s in Vegas, as a celebrity cheftestant on “Top Chef’s” sixth season. Today she’s top chef at Stopsky’s Delicatessen, a 36-seat restaurant and take-out shop on Mercer Island, built as a modern Jewish deli with a Pacific Northwest twist. Stopksy’s in the name of love! Snake River Wagyu pastrami? Seattle’s Ebb+Flow gin-cured lox? Chicken-liver mousse stuffed in a pickled egg? Be still my beating heart attack! I caught up with Leventhal as she prepared to open for business at 3016 78th Ave. 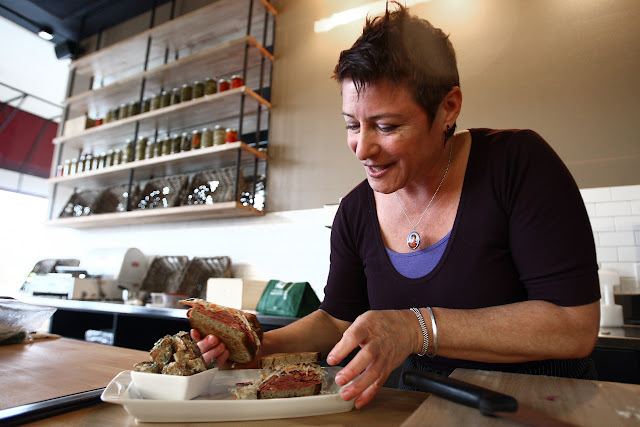 S.E., where she’s been given creative license to make Mercer Island a deli-food destination. Robin Leventhal at Stopsky’s — set to open in May, next door to Island Books on Mercer Island. Q: Stopsky’s, slated to open in May, gets its name via owner Jeff Sanderson, a former Microsoftie who’s a softy for Jewish food and culture. I hear it’s named to honor the Stopsky brothers — his grandfather and great uncles who emigrated to the U.S. from a small Jewish village outside Kiev, Ukraine. Which (call me crazy, no?) sounds very “Fiddler on the Roof.” So tell me: Did Sanderson find you via Matchmaker-Matchmaker.com? A: Jeff and his wife Lara cold-called me. They’re venture capitalists and were drawn to my involvement with Fred Hutch, and with my work helping raise funds to find a cure for lymphoma. It’s been seven years since my diagnosis (my Hodgkins is in remission and my non-Hodgkins is something I’ll be fighting for the rest of my life), and my spirit embodied the philosophy behind their business — developing community. Having never been in this industry, they needed someone to step in, build a staff and support their vision for Stopsky’s. Q: Speaking of staff, I hear you’ve landed a hotshot baker. 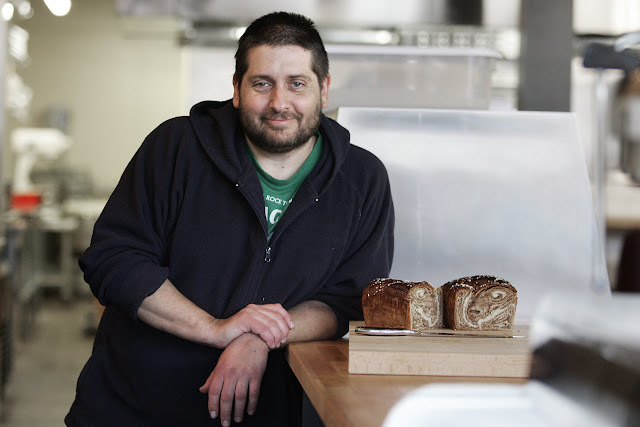 A: Andrew Meltzer, the co-founder of Columbia City Bakery, will be making our bread. He was most recently at Canlis, and left to take this position. Andrew wants to put love into every bagel he makes, so he’s making only four flavors: We won’t be competing with Noah’s Bagels. He’ll make our seeded rye [for “Robin’s Reuben”] and our challah on Fridays [among other breads and pastries]. Baker Andrew Meltzer with (oy! give me some of that) loaf of babka, a Jewish bakeshop favorite. Q: Once open, Stopsky’s will serve breakfast, lunch and weekend brunch, offering take-out daily from 7 a.m. to 7 p.m., with dinner in the offing. What can we expect to find here that we won’t find elsewhere? A: Candied salami, pan-seared with sherry vinegar and maple syrup — for our house-made-salami and eggs. It’s my bacon! We’ll have matzo-ball soup, but my matzo balls will be shaped like quenelles: “petals” made with two spoons. Drawing inspiration from Sephardic culture and Spanish cuisine, I’m making escabeche salmon, my take on kippered salmon. And we want to revisit kasha varnishkes, so I’m using black barley instead of buckwheat and making the pasta for the bow-ties. We’ll be making our own pickles, too, and 10 percent of all retail pickle sales will go to the Hutch. Q: Retail sales? Kvell about that, please. Q: Growing up in Sun Valley, Idaho, where did you eat Jewish deli food? A: At Nate ‘n’ Al in Beverly Hills — when we’d go to L.A. twice a year to visit our relatives. It was a treat, and something I have a very fond affinity for. I was not raised by a mother who cooked: She made reservations. But my grandmother did make awesome cabbage rolls. Q: So, will your bubbie’s photo be found on the wall at Stopsky’s, as part of the rotating display that embraces the Sanderson’s “Heritage Project” — where they asked local folks to submit family photos of their ancestors and of “meaningful events” including weddings and bar mitzvahs? 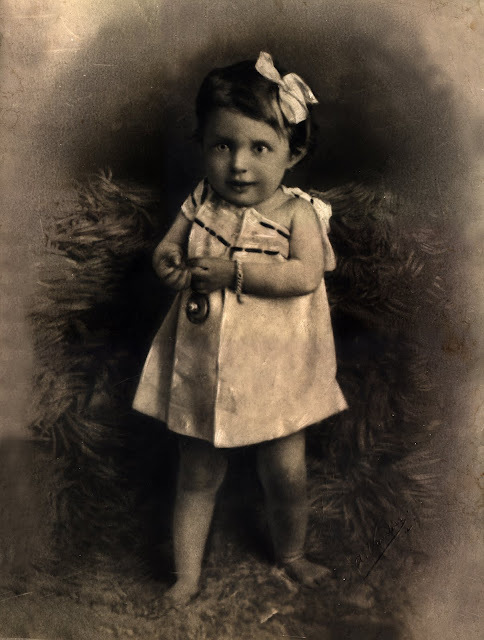 Robin’s grandmother, Suzanne Getz, now 101, at age 3 [courtesy Robin Leventhal]. A: Yes. There will be one of my 101-year-old grandmother, Suzanne Getz, when she was 3. And we’ve got a photo of the grandfather from the original Brenner Brothers Bakery. If I were to contribute to the wall, I’d send this classic from my dad’s bar mitzvah. 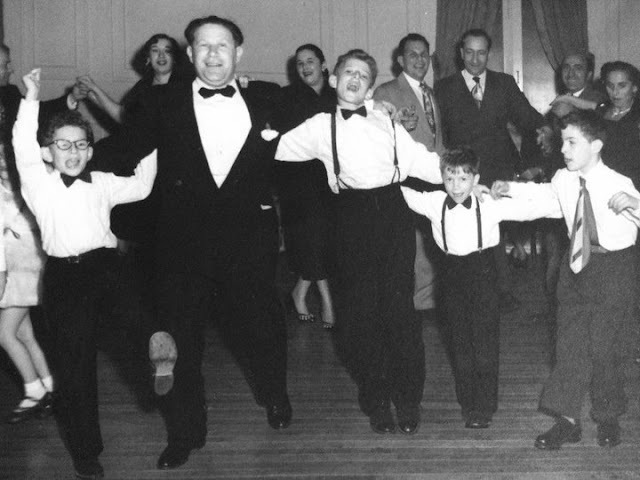 That’s my grandfather, Sol Leson (second from left) born not-too-far from the Stopsky brothers, dancing the hora surrounded by (far left) Uncle Joel, my dad (center), Uncle Michael (second from right) and cousin Danny Gelman (far right). Q: I’ve heard rumblings about the fact that Stopsky’s isn’t kosher — an apparent disappointment to the kosher-keeping community on Mercer Island. Nu? A: As much as we’d love to make everybody happy, it wasn’t practical for us. People are going to have expectations, and what we expect to do is bring together the best of the Northwest, marrying it to the amazing flavors of the world’s Jewish cuisines. Our goal is to create a place that will be here for a long time.